If your diet is missing the key vitamins or nutrients you need on a day-to-day basis — or you have a diagnosed deficiency that increases your disease risk — your doctor may recommend taking supplements. But for most people, they aren’t necessary for eye health. You can get the vitamins you need through your diet. And there is little evidence connecting vitamin supplements with improved eye health. There’s one exception for a specific eye condition: age-related macular degeneration (AMD). If you have AMD, talk to your ophthalmologist about whether supplements are appropriate. Research conducted by the Age-Related Eye Disease Study (AREDS) has shown that people with AMD might benefit from taking specific vitamins. 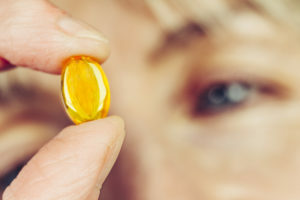 The group’s second study, AREDS 2, determined that taking certain vitamins in high concentrations slows the progression of this condition in a large percentage of people. However, the study notes that taking these vitamins can only slow the disease. Unfortunately, no vitamins can prevent it from forming in the first place. All of these vitamin supplements are available over the counter. Look for a combination labeled for eye health. Just be sure to consult with your doctor about any health conditions you have, since any supplement comes with potential risks. For other eye conditions, the evidence is limited. Many simply haven’t been evaluated as thoroughly as AMD with regard to diet and nutrition, so there’s no strong recommendation for taking vitamin supplements for them. AREDS did study cataract formation, but the results were too limited to produce a strong recommendation for supplements. As for glaucoma, there is little evidence that vitamins have any impact on this condition. However, for dry eye, the omega-3 fatty acids that people sometimes get in supplements such as fish oil may offer relief from symptoms. In general, it’s best to eat a diet with a full complement of nutrition to ensure you aren’t vitamin-deficient. That’s true not only for your eye health, but also for your overall health. Foods that have high levels of the same elements found in the AREDS formula will certainly have some benefit. For example, leafy green vegetables such as spinach, kale, mustard greens and others offer many of the vitamins and nutrients that are good for eye health. Likewise, if you want to boost your omega-3 intake, you can find it in fatty fish and many types of nuts and seeds. And carrots are high in vitamin A, which is important in retina metabolism. But beyond vitamin A, carrots don’t hold any magical properties for eye health. That may come as a surprise if you were told growing up — like I was — that rabbits never wear glasses.